The NASCAR circuit wrapped up its second race on the 2018 schedule Sunday at Atlanta Motor Speedway. Only two races in, we see a lot of parallels to yesteryear. If it wasn’t enough to see the No. 3 return to Victory Lane last weekend at Daytona, Kevin Harvick’s win only added to the nostalgia. Dillon won 17 years to the date after Dale Earnhardt was killed on the last lap of the Daytona 500. 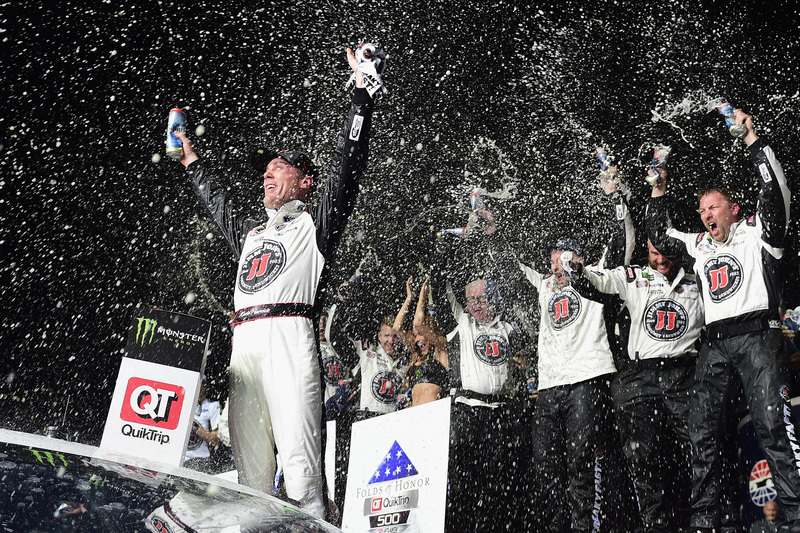 Harvick won at Atlanta in 2001, in his third career race in NASCAR’s top series. Perhaps it’s an equipment issue with Hendrick Motorsports. Maybe it’s the start of the decline of one of NASCAR’s greatest drivers. It all started last year. Johnson won three races and made it the Round of 8 in the Playoffs. But it was a lucky year. He won three races early, and none of them showed the dominance we’re used to seeing. In fact, he failed to lead the most laps among the competition in any of the 36 races in 2017. That was the first time in his Cup career he didn’t lead the most laps in at least one event. He leads all active drivers in that category. 2017 was his worst year in a few statistical categories, and it seemed no one talked about it heading into this year. During the races, our team is always looking at and crunching numbers. We look at data and see if any stories could be pulled. Our team noticed two things during the Folds of Honor QuikTrip 500 once we realized he was not going to be a contender: Johnson now had the longest winless drought of his career (25 races) and the longest streak of consecutive races without a top-10 finish (eight). Our team was working this story, gathering all of the information, and it was my job to track down the seven-time champion and get his take on it. Once the race ended and the top-finishing cars were lined up on pit road, it was a free-for-all among the rest of the competition. Lapped cars were blended with lead lap cars. Drivers were climbing out and starting to scatter. Parked with the last of the cars on pit road is the No. 48 Chevrolet. As I walk along the pit road wall, I see Johnson walking towards the wall and about to head out for the night. This wasn’t the same Jimmie Johnson I’m used to seeing. He was visibly frustrated and looked like he was ready to head home. He just finished four laps down and spun out during the race. I approached him and asked if I could interview him. He agreed. As we walk behind the pit boxes towards the ramp to the garage area, a barrage of fireworks starts out of Turn 3. Great for visuals, but worse for me because the driver likely wants me to ask my questions and be done with it. After 30 seconds of a great display and sound of freedom, I finally get to ask my one and only question. I asked Johnson along the lines of what he needs to do to snap the win and top-10 skid. “You tell me, we’ll figure it out,” Johnson said as he climbed into a covered golf cart and his chauffeur drove off. Because of the Earnhardt ties at Daytona and Harvick’s win, this season is feeling like 2001, although it’s only two races into the year. Now, all we need is the No. 24 to win some races along with the title. As for Johnson, we’ll see how he and the rest of Hendrick Motorsports stack up after NASCAR’s west coast swing.